Lois Marie Mueller, 90, of Albion, NE passed away on Sunday, June 4, 2017 at her home in rural Albion. 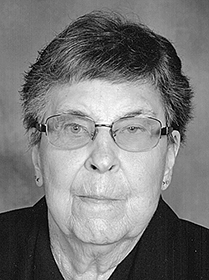 Lois, daughter of Herman and Edith (Peterson) Rojohn, was born on Sept. 15, 1926 on a farm northeast of Albion. Lois is survived by two daughters Kathy (Dean) Eickhoff of Albion; Nancy Burbach of Newman Grove; daughter-in-law Linda Mueller of Albion; five grandchildren and six great grandchildren; Shelley (Dan) Lueken and children Lauren and Katie of Albion; Nathan Mueller of Albion; Suzanne Riley and son Graysen of Norfolk; Jeff (Erin) Eickhoff and children Evan, Reagan, and Joslyn of Albion; Andy Eickhoff and fiancé Courtney Stephan of Albion; sister Mary Lou (Iver) Nore of Albion; brother-in-law Wayne Quinn of Omaha; along with other relatives and friends. She was preceded in death by her parents, husband Leo, son Jerome, and sister-in-law Ruth Quinn. Funeral services will be Wednesday, June 7, 2017 at 10 a.m. at the United Methodist Church in Albion with Rev. Janet Burgel officiating. Interment will follow in the Rose Hill Cemetery in Albion. Levander Funeral Home in Albion is in charge of arrangements. Condolences may be sent to the family at: www.levanderfuneralhome.com.